ဘင်္ဂလားကျား (P. t. tigris), အိန္ဒိယကျား ဟုလည်း ခေါ်သည် Lives in India, Nepal, Bhutan, and Bangladesh, and is the most common subspecies. In 2011, the total adult population was estimated at 1,520–1,909 in India, 440 in Bangladesh, 155 in Nepal and 75 in Bhutan. In 2014, the population in India was estimated at 2,226, 163–253 in Nepal and 103 in Bhutan as of 2015. It lives in alluvial grasslands, subtropical and tropical rainforests, scrub forests, wet and dry deciduous forests, and mangroves. It is the second-largest of the surviving subspecies. Males attain a total nose-to-tail length of ၂၇၀ to ၃၁၀ cm (၁၁၀ to ၁၂၀ in) and weigh between ၁၈၀ to ၂၅၈ kg (၃၉၇ to ၅၆၉ lb), while females range from ၂၄၀ to ၂၆၅ cm (၉၄ to ၁၀၄ in) and ၁၀၀ to ၁၆၀ kg (၂၂၀ to ၃၅၀ lb). In northern India and Nepal, the average is larger; males can weigh up to ၂၃၅ ကီလိုဂရမ် (၅၁၈ ပေါင်), while females average ၁၄၀ ကီလိုဂရမ် (၃၁၀ ပေါင်). Coat colour varies from light yellow to reddish yellow with black stripes. အင်ဒိုချိုင်းနားကျား (P. t. corbetti) ကော်ဘက်ကျား ဟုလည်း ခေါ်သည် Is found in Cambodia, China, Laos, Burma, Thailand, and Vietnam. In 2010 the total population was estimated at about 350 individuals. Their preferred habitat is forests in mountainous or hilly regions. Males average ၁၀၈ လက်မ (၂၇၀ စင်တီမီတာ) in total length and weigh between ၁၅၀–၁၉၅ kg (၃၃၁–၄၃၀ lb), while females average ၉၆ လက်မ (၂၄၀ စင်တီမီတာ) and ၁၀၀–၁၃၀ kg (၂၂၀–၂၉၀ lb). မလေးကျား (P. t. jacksoni) Exclusively found in the southern part of the Malay Peninsula. The last native wild tiger in Singapore was shot dead in 1930. Was not considered a subspecies in its own right until a 2004 genetic analysis showed that they are distinct in mtDNA and micro-satellite sequences from the Indochinese subspecies. As of 2014 the total population is estimated at fewer than 500 individuals, though a new report from September that year estimated it at between 250 and 340 individuals. Males range in total length from ၁၉၀–၂၈၀ cm (၇၅–၁၁၀ in) and weigh between ၄၇.၂ to ၁၂၉.၁ kg (၁၀၄ to ၂၈၅ lb), while females range from ၁၈၀–၂၆၀ cm (၇၁–၁၀၂ in) and ၂၄ to ၈၈ kg (၅၃ to ၁၉၄ lb). Southeast Asia: Malaysia; extinct in Thailand and Singapore. ဆိုက်ဘေးရီးယားကျား (P. t. altaica), အေမာကျား ဟုလည်း ခေါ်သည် Inhabits the Amur-Ussuri region of Primorsky Krai and Khabarovsk Krai in far eastern Siberia, with the exception of a small population in Hunchun National Siberian Tiger Nature Reserve in northeastern China, near the border of North Korea. In 2005, there were 331–393 adult and subadult Siberian tigers in the region, with a breeding adult population of about 250 individuals. As of 2015, there an estimated population of 480-540 individuals in the Russian Far East. It is the largest subspecies and ranks among the largest felids ever to have existed. Males have a head and body length of between ၁၉၀–၂၃၀ cm (၇၅–၉၁ in) and weigh between ၁၈၀ to ၃၀၆ kg (၃၉၇ to ၆၇၅ lb), while females average ၁၆၀–၁၈၀ cm (၆၃–၇၁ in) and ၁၀၀ to ၁၆၇ kg (၂၂၀ to ၃၆၈ lb). Tail length is about ၆၀–၁၁၀ cm (၂၄–၄၃ in). Compared to other subspecies, Siberian tigers have thicker coats, paler hues, and fewer stripes in dark brown instead of black. တောင်တရုတ်ကျား (P. t. amoyensis) အမွိုင် သို့မဟုတ် ရှမင်ကျား ဟုလည်း ခေါ်သည် Is the most critically endangered subspecies of tiger, and one of the 10 most endangered animals in the world. Despite unconfirmed reports and some evidence of footprints, there has been no confirmed wild sighting in over 25 years, leading experts to consider it "functionally extinct", with the entire known population of roughly 65+ individuals held in captivity. It is the second-smallest subspecies. Males range in total length from ၂၃၀–၂၆၀ cm (၉၁–၁၀၂ in) and weigh between ၁၃၀ to ၁၈၀ kg (၂၉၀ to ၄၀၀ lb), while females range from ၂၂၀–၂၄၀ cm (၈၇–၉၄ in) and ၁၀၀ to ၁၁၀ kg (၂၂၀ to ၂၄၀ lb). The South China tiger is considered to be the most ancient of the tiger subspecies and is distinguished by a particularly narrow skull, long muzzle nose, rhombus-like stripes and vivid orange colour. ဆူမားတြားကျား (P. t. sumatrae) Found only on the island of Sumatra, and is thus the last surviving of the three Indonesian island subspecies. Listed as a distinct subspecies as of 1998, when genetic testing revealed the presence of unique genetic markers, and is critically endangered. As of 2014 the wild population is estimated at between 400 and 500, seen chiefly in the island's national parks. It is the smallest of all living tigers. Males range in total length from ၂၂၀ to ၂၅၅ cm (၈၇ to ၁၀၀ in) and weigh between ၁၀၀ to ၁၄၀ kg (၂၂၀ to ၃၁၀ lb), while females range between ၂၁၅ to ၂၃၀ cm (၈၅ to ၉၁ in) and ၇၅ to ၁၁၀ kg (၁၆၅ to ၂၄၃ lb). Their reduced size is an adaptation to the thick, dense forests and smaller prey in their native habitat. This subspecies also has the darkest coat, with more narrowly spaced stripes and a longer mane and beard. ဘာလီကျား (P. t. balica) Was limited to the Indonesian island of Bali. Had a weight of ၉၀–၁၀၀ kg (၂၀၀–၂၂၀ lb) in males and ၆၅–၈၀ kg (၁၄၃–၁၇၆ lb) in females. Bali tigers were hunted to extinction; the last Bali tiger, an adult female, is thought to have been killed at Sumbar Kima, West Bali, on 27 September 1937, though there were unconfirmed reports that villagers found a tiger corpse in 1963. The Bali tiger is reported to have had some spots in between its stripes. ကက်စပီယန်ကျား (P. t. virgata), ဟိုက်ကေးနီးယန်းကျား သို့မဟုတ် တူရန်ကျား ဟုလည်း ခေါ်သည် Was found in the sparse forest habitats and riverine corridors south and east of the Black and Caspian Seas, through the Pontic-Caspian steppe into Central Asia, and onto the Takla-Makan desert of Xinjiang. The Caspian tiger had been recorded in the wild until the early 1970s. The Siberian tiger is the genetically closest living relative of the subspecies. ဂျာဗားကျား (P. t. sondaica) Was limited to the island of Java, and had been recorded until the mid-1970s. Javan tigers were larger than Bali tigers; males weighed ၁၀၀–၁၄၁ kg (၂၂၀–၃၁၁ lb) and females ၇၅–၁၁၅ kg (၁၆၅–၂၅၄ lb). After 1979, no more sightings were confirmed in the region of Mount Betiri. An expedition to Mount Halimun Salak National Park in 1990 did not yield any definite, direct evidence for the continued existence of tigers. An analysis of craniodental and pelage morphology, ecology, and molecular biology of the tiger subspecies indicates that they have many traits in common and that the genetic diversity between them is low. The authors of this analysis suggest to group the Bengal, Indochinese, Malayan, South China, and Siberian tiger subspecies to the Continental tiger Panthera tigris tigris; and the Sumatran, Javan and Bali tiger subspecies to the Sunda tiger Panthera tigris sondaica. This classification is intended to facilitate tiger conservation management, both regarding breeding programmes in zoos and future translocations in the wild. The classification is criticised by several geneticists, who maintain that the currently recognised nine subspecies can be distinguished genetically. The liger is a cross between a male lion and a tigress. Because the lion sire passes on a growth-promoting gene, but the corresponding growth-inhibiting gene from the female tiger is absent, ligers grow far larger than either parent. They share physical and behavioural qualities of both parent species (spots and stripes on a sandy background). Male ligers are sterile, but female ligers are often fertile. Males have about a 50% chance of having a mane, but, even if they do, their manes will be only around half the size of that of a pure lion. Ligers are typically between 10 and 12 feet in length, and can weigh between 800 and 1,000 pounds or more. ↑ PBDB. www.paleobiodb.org. Retrieved 2017-03-03. ↑ Karanth, K. U. (2003). 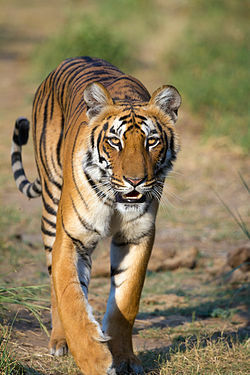 Tiger ecology and conservation in the Indian subcontinent. Journal of the Bombay Natural History Society 100 (2&3) 169–189. ↑ Bengal tigers have Smith, James L. David (1983). "A technique for capturing and immobilizing tigers". The Journal of Wildlife Management 47 (1): 255–259. doi:10.2307/3808080. Table 1 entries on page 257 are Adult females N=19 mean=140 Range=116–164, Adult males N=7 mean=235 Range=200–261. ↑ Luo, S.-J. (2004). 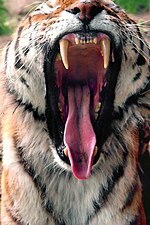 "Phylogeography and genetic ancestry of tigers (Panthera tigris)". PLoS Biology 2 (12): e442. doi:10.1371/journal.pbio.0020442. PMID 15583716. ↑ Khan, M.K.M. (1986). "Tigers in Malaysia". Journal of Wildlife and Parks V: 1–23. ↑ Kerley, L.L. (2003). "Reproductive parameters of wild female Amur (Siberian) tigers (Panthera tigris altaica)". Journal of Mammalogy 84: 288–298. doi:10.1644/1545-1542(2003)084<0288:RPOWFA>2.0.CO;2. ↑ "Sorting out tigers (Panthera tigris): mitochondrial sequences, nuclear inserts, systematics, and conservation genetics" (1998). Animal Conservation 1 (2): 139–150. doi:10.1111/j.1469-1795.1998.tb00021.x. ↑ "Mitochondrial Phylogeography Illuminates the Origin of the Extinct Caspian Tiger and Its Relationship to the Amur Tiger" (2009). PLoS ONE 4 (1): e4125. doi:10.1371/journal.pone.0004125. PMID 19142238. ↑ Mazák, J.H. (2006). "A taxonomic revision of the tigers (Panthera tigris)". Mammalian Biology 71 (5): 268–287. doi:10.1016/j.mambio.2006.02.007. ↑ Seidensticker, J. (1987). "Bearing Witness: Observations on the Extinction of Panthera tigris balica and Panthera tigris sondaica". pp. 1–8 in: Tilson, R. L., Seal, U. S. (eds.) Tigers of the World: the biology, biopolitics, management, and conservation of an endangered species. Noyes Publications, New Jersey, ISBN 0-8155-1133-7. ↑ "Untersuchung über die Carnivoren des Gunung Halimun Naturschutzgebietes." (1991). Zoologische Gesellschaft für Arten- und Populationsschutz e.V. Mitteilungen 7 (2): 3–5. ↑ "Planning tiger recovery: Understanding intraspecific variation for effective conservation" (2015). Science Advances 11 (5: e1400175): e1400175. Science Advances. doi:10.1126/sciadv.1400175.